My blood and heart are pumping. My mind and body are in awe of what they just experienced – maybe to never experience again. I’m sitting at the Wiwin restaurant along the shore of Gili Air watching a vivid orange boat floating in front of the mountains of Lombok. My ginger tea is on the way and my hands can barely write. They’re cold and excited to write down the experience. The waves are lapping and the broken bits of coral and shells sing with the under tow. It’s the water fairy song and I can imagine Miss I dancing to it. I just spent the last hour in the ocean swimming with, breathing with and touching a sea turtle! I found him on my way back to shore after snorkeling. I nearly missed him. His shell blended into the ocean floor and rocks well. He was feeding on the coral and plants near the bottom, sometimes letting himself float vertically – giving me a peek at his underside. I watched him eat for a while and then he started to rise up and I touched his shell. He descended again for a nibble and surfaced. This time both of my hands held his shell gently. I didn’t know. Should I / Could I touch him? Can he snap my hand off? I reached out anyway. Curious, peaceful and fascinated. His shell was slippery. He looked back and his eyes connected with mine and we swam up to the surface together. As his head was about to break the water’s surface – my curiosity peaked. We rose our heads together above the water, my hands still on his shell. His pointy mouth opened and he exhaled and inhaled another breath allowing him to dive below again. His breath sounded like a sleeping baby taking in a quick, deep inhale – peaceful and smooth. Down he went again. Sometimes to take a nibble and other times he stayed near the surface, allowing me to keep my hands on his shell and swim with him. I was hoping he’d communicate his age old secrets to me while we swam together. While we swam, we let me touch his head a perfect tortoise shell pattern of black, light brown and yellow on it. He allowed me to stroke his very wrinkled, tough neck and even his smooth, patterned flippers – dark on one side and light yellow on the other. His slightly pointed mouth bit off large chunks of plants and coral, leaving floating bits for the reef fish that surrounded him. I caught one of the bigger pieces of seaweed and held it in my hand steadily. Slowly, the reef fish came to eat it out of my hand! SURREAL! Blue, white, yellow fish with the cutest pucker mouths were taking bits of food from my comparatively large hand. 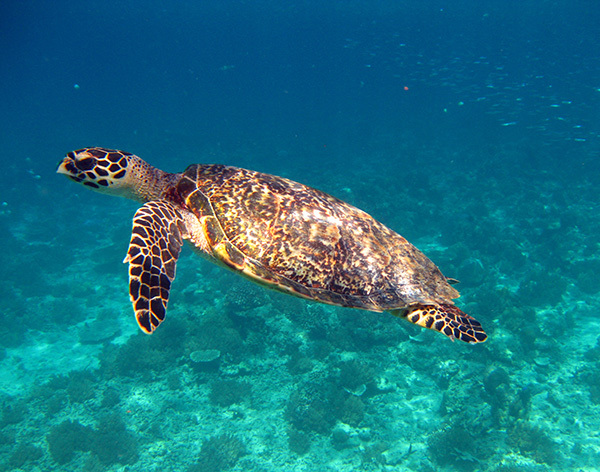 I spent an hour with the sea turtle – both our bodies swaying with the currents. We surfaced 8-10 times together, heads close together and synchronized. Each taking a breath and trusting the other to be just who we are. It was one hour experiencing life as a turtle. I can’t think of anything else I’d rather do at the moment. For the last 5 minutes, we remained in shallow waters, my hands connected to his shell the entire time. Magic! I left the sea turtle. My hands were freezing and shriveled. As I swam back to shore I passed a section of sea grass filled with millions of warm orange fish. It was like being in a wheat field during sunset – golden orange colors all around me. I sat in the shallow water – took my gear off and tried to wipe the Chesire cat smile off my face, but couldn’t. Maybe, just maybe I am living and fully engrossed in the age old secret.